OMAHA, Neb. 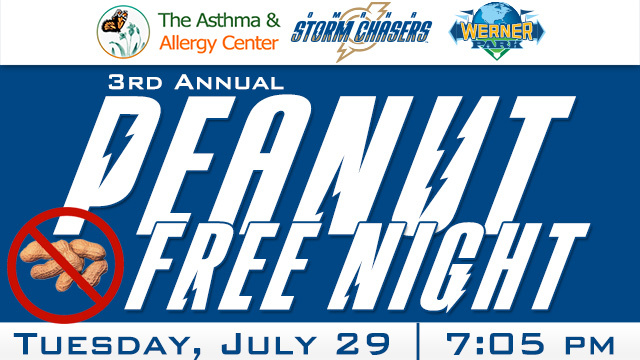 - Next Tuesday, the Omaha Storm Chasers will kick off their eight-game homestand with "Peanut Free Night" in association with the Asthma and Allergy Center, allowing fans affected by various allergies to visit Werner Park worry free in the third annual event. "Peanut Free Night with the Omaha Storm Chasers is fast becoming one of our most unique, community events," said Martie Cordaro, President and General Manager for the Omaha Storm Chasers. "Our ballpark operations staff, led by Brett Myers and Matt Owen, work tirelessly to make sure that Werner Park is safe for all those that would otherwise not be able to attend a professional baseball game." For this special night, Werner Park will not serve any peanut-related items including sunflower seeds, tree nuts and of course peanuts. The process of deep-cleaning Werner Park for any peanut residue started immediately after Omaha's game this past Sunday and will continue up until Tuesday. Werner Park also features gluten-free and vegetarian options at the Heartland Healthy Cart and other areas throughout the park. "We are excited to see all the allergic families come out to the baseball game in a peanut-free environment. We've heard from parents telling us how much they appreciate this opportunity to have their children experience one of America's past-times," said Dr. Gregory Daniel Brooks of The Asthma and Allergy Center. "Peanut Free Night gives everyone a chance to raise awareness about food allergies and learn about new products, research and education. The Asthma & Allergy Center is proud to be a sponsor of Peanut Free Night and to help provide this night of baseball for all the allergic community. "